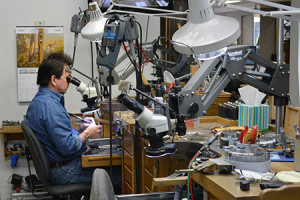 The jewelry repair and restoration department is an integral part of Joden Jewelers, World Resources. 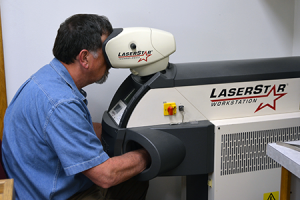 Our expert jewelers craft and repair some of the finest jewelry in existence with our state of the art machinery including bench mounted microscopes and a laser welding system that is one of few in the country. These expert craftsman work full-time in our store, restoring your treasured heirlooms, as well as creating your heirlooms of the future. We offer repairs such as precious stone replacement, jewelry prong repair, jewelry clasp repair, jewelry redesign, custom jewelry design, jewelry cleaning and polishing to name a few. Joden is fortunate to offer over 45 years of combined skill and high tech equipment which allows us to do certain complex repairs and restorations that were not possible even a few years ago. We invite you to come to us for the refurbishment of your jewelry or to design the ring of your dreams. Contact us if you have a piece which you would like to have inspected or repaired, we have many safe, fully insured shipping options. At Joden, there is no job related to jewelry that we cannot do.